Omnitrend software has been around for a while. My first experience with them was an immense game (four disks!) for the 8- bit Atari computer line called Universe. Universe was an extremely complicated game, creating within the confines of those four disks an entire galaxy to explore. It was the type of game you had to dedicate every waking moment to. By the time Thomas Carbone and William Leslie, the two young men who were the sole staff of Omnitrend (doing both the programming and the marketing themselves) were ready for another project, they had decided that their ideas had already grown past the limits of the 8-bit computers and announced that the sequel to Universe, aptly titled Universe II, would run only on the new wave of home microcomputers, and luckily for us that new wave included the ST. I say "lucky for us" not so much because I was particularly enamored of Universe II. That game was just as immense and complicated as its predecessor— not the type of game my schedule will tolerate. No, I say lucky because all those early projects (especially Breach which followed Universe II) led Mr. Carbone and Mr. Leslie to the creation of Paladin—and a fine creation it is. Paladin is a hybrid of conventional war games and fantasy role-playing games. It's a game that requires thought and strategy—which means you get a break from battling frantically with a joystick. In addition, there are no time limits; the game operates on the "turns" principle, so the player can sick back and plan his moves leisurely. Paladin is made up of a series of quests, each of which has a victory condition that must be met. The victory condition may be as simple as killing a certain percentage of the enemy and then getting all your men to the exit; or it may be much more complicated, requiring the completion of several tasks in order to win. Some quests lead immediately to others; while others are simple, one-quest games. To play Paladin you move your characters around a game map, picking up items, exploring new territory and fight ing the enemy. Each character is allowed a limited number of moves per turn, and each action the character enacts—moving, swinging a sword, picking up an item, etc.—uses up a certain number of those moves. When you've completed your turn, the enemy then makes its moves. Unlike many war games, the characters and terrain in Paladin are not just simple icons. The graphics have been fleshed out and animated to add realism to the game. When you move a member of your party, he walks to the new location. When you attack with a sword, the weapon is actually swung at the enemy. Magical spells too have small bits of animation to keep the game interesting: fireballs explode, wiping out large areas of the terrain; and stun spells cause victims to glimmer momentarily. Winning a battle is always a treat; not only are you one step closer to fulfilling your victory condition, but you also get to hear a marvelous digitized death scream. Of course, you get to hear the scream when one of your own party members gets killed, too—not nearly as entertaining in that situation. Your party is made up of various types of characters including a paladin (when you lose him, the game is over), swordsmen, rangers, thieves and mages. The enemy comes in various forms, as well: zombies, sorcerers, trolls, spirits and others, each with their own nasty way of inflicting damage on your poor group of adventurers. Like most role-playing games, your party members have personal attributes, including vitality, health, encumbrance, accuracy of swordmanship and so on. Some of these attributes can be restored by resting or using potions; others require you to lighten your load or acquire special items hidden throughout the game. 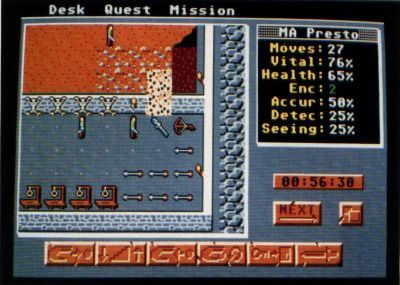 Using the mouse to click on various icons along the bottom of the screen orders your characters to pick up objects, drop objects, open doors, climb stairs, cast spells and use items in various ways. These choices, in combination with the large number of objects available in Paladin, give the player plenty of moves to choose from and keeps the game challenging and fresh. Paladin comes on two disks, one of which includes a number of quests for you to complete. Once you're familiar with the game (and that won't take too long), or have tired of the included quests, you can use the included quest builder program to create your own games. A map for a quest may consist of nothing more than a forest with a couple of rivers and pathways, or it may be as complicated as a large castle, filled with rooms and closets to explore. Paladin is a habit-forming game. Once you get started you may find it difficult to turn off the computer and get back to the real world. "Paladin is a hybrid of conventional war games and fantasy role-playing games. It's a game that requires thought and strategy."